Tip---after downloading the resume file, just make the location for saving it as your desktop. 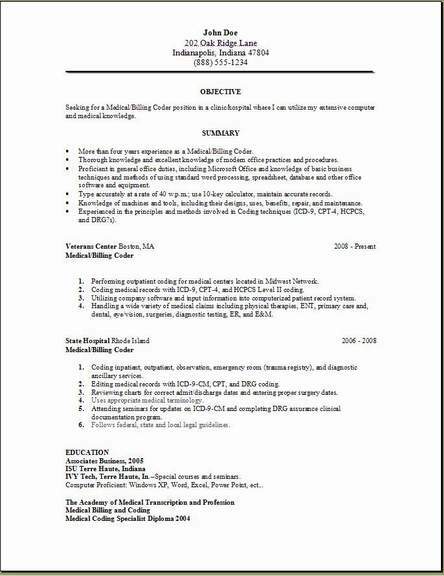 3 medical billing formats everyone uses that will help you to create a wonderful resume. 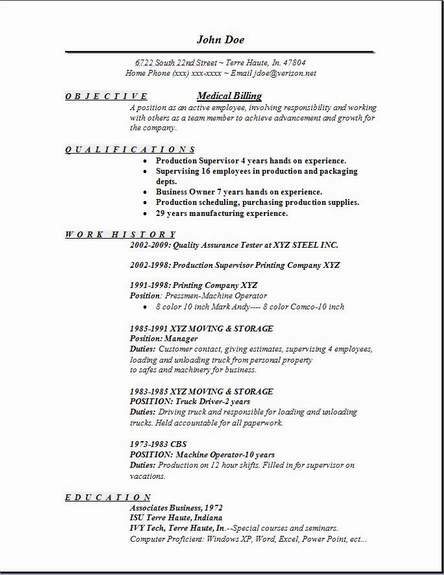 The style of these resumes make things easy for you to do your editing. They will also make the job history section pop. Get use to backspacing and then entering information because really, that is all you have to be able to do to complete this quickly. You decide you would like to be in the field of Medical billing. Then we are here to help you with your choice of getting a medical billing resume completed and on it's way to your next employer. 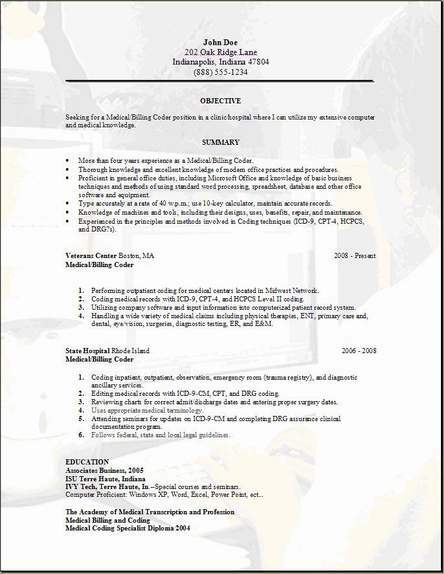 1) Analytical skills: You need to understand how medical records work, and how to code them. 2) Integrity: All medical information is confidential, so you must keep it that way. 3) Personal skills: You need great communication skills with doctors and finance departments. 4) Technical skills: You will need to operate the special software programs that your employer has adopted. These coding professionals will keep excellent records, calculate the patients billing charges and review the patient’s files for any errors. The medical coder’s main responsibility is to be used in the collection of each physicians charges and for the collection of patient data and to follow established procedures for filing claims. They are then required to submit the claim to an insurance carrier very accurately, using the safest and most efficient way in an expeditious manner. Also additionally, medical billing coders must have the knowledge and training skills to determine the codes for all the physician procedures and also their diagnosis – they do this by using coding protocols – that are for use by a third party billing company. This is absolutely, a hot career in health care that is growing continuously. 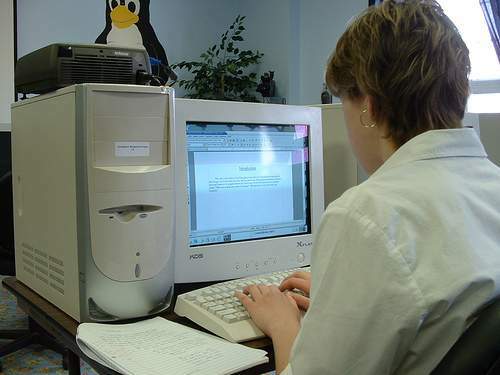 Medical Billing and Coding careers are in great demand. Physician practices, all hospitals, all pharmacies, long-term health care facilities and various health care givers and providers all will depend heavily on using medical billing, and of couse medical coding, to get a reimbursement from their patients insurance. This is a great career to check in to for more schooling. An associate’s degree in the fields of medical terminology, or anatomy, health data requirements, coding systems, healthcare statistics, and also medical billing software. You can also complete technology programs, either ordered on line courses, or in person to increase your chances. Although, if you have a lot of knowledge in the field, and have all the skills above, on the job training will more than likely be provided, and you could get hired from a recommended source as a trainee. Most of these jobs will be nine to five, mostly in hospitals, around 37% and physicians' offices, 22%.